Veteran TV Journalist, Jeff Koinange reveals his steady respect for women, not forgetting to mention his own mother, a young widow. In a candid interview with Yvonne Aoll, Jeff Koinange articulates: Respect! My mother, again, a young widow, she didn´t remarry, she was committed to educating her children, and she´s still alive, she´s over 70 years old now. That´s respect right there. The former CNN Journalist not only respects his widow mother, but all women across the African continent, and probably, beyond: And every time I interview women on my show, I realize it´s long overdue that Africans gave women the mantle. It should have been done a long time ago. If women were to run this continent, oh, I tell you, it would be, ´SMOKING!´ Youth unemployment rate Jeff was then asked of his opinion about talented individuals who are managing side hustles for maximum income: I think it´s people´s attitudes. You can make money with whatever you do, you can make money selling newspapers on the streets. You can make money selling books. Look, if you don´t believe you can do something, then you won´t do it. If you believe you can do it…! I mean, who ever thought the likes of Kipchoge Keino, going on down, that one day, they´d be multimillionaires? And that´s running only, you talk about us, and what we do? This, this is a different kettle of fish. You can make a hell of a lot of money, if that´s your intention, you can. Jeff is unarguably a renowned International Journalist whose stage set and show drive stands out in the Local media Industry. The Citizen TV Journalist also doubles up as a radio show host, on Citizen´s ´Hot 96´. The post SMOKING! 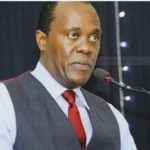 ¨It´s looong overdue that Africans gave women the mantle¨ Jeff Koinange reveals his solid respect for his widow mother and beyond appeared first on Ghafla! Kenya.